What Happens When an Economist Walks Into a Brothel? To learn how to manage risks in your life, don’t consult office-bound economists or actuaries. Ask the real experts: prostitutes, gamblers, magicians, paparazzi, big-wave surfers, movie producers, horse breeders, and soldiers. Their careers require them to take risks. They succeed by doing so smartly—deriving as much benefit as possible per unit of risk taken. 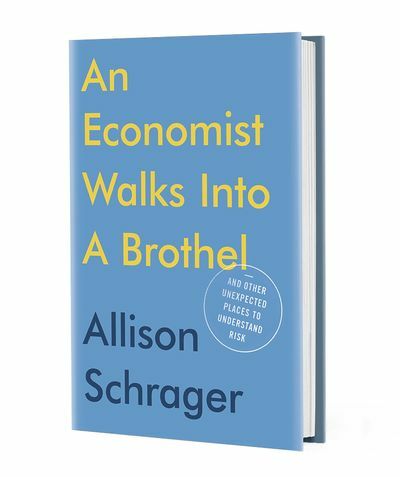 Allison Schrager, herself an economist, though not of the office-bound variety, interviewed all of these exotic professionals for an intriguing new book, An Economist Walks Into a Brothel: And Other Unexpected Places to Understand Risk. No risk, no reward. You need to take risks, but make sure you have a clear objective. “We often take big risks without thinking through what we want, just that we need a change and want to shake things up,” she writes. Schrager discovered that big-wave surfers, far from being happy-go-lucky, are control freaks—which makes sense, because the careless ones don’t survive. Get the biggest bang for your risk buck. Don’t put all your money into one investment unless you’re really sure that it’s a winner, which you never really are. “Taking more risk than necessary is inefficient.” To me, this is the core idea of the book. Risk is a topic of constant interest here at Bloomberg. The latest issue of Bloomberg Businessweekfeatures a “CEO’s Guide to Taking Risks: How to make bold moves without being reckless.” Its advice overlaps with Schrager’s—“Acknowledge your temperament” sounds a lot like “I am irrational and I know it.” Meanwhile, John Authers, Bloomberg senior editor for markets, has launched an online book club whose first author is the late Peter Bernstein, who wrote Capital Ideas: The Improbable Origins of Modern Wall Street as well as Against the Gods: The Remarkable Story of Risk. Chief executive officers and Wall Street players could learn a thing or two from the paparazzi, prostitutes, and other outre characters who inhabit An Economist Walks Into a Brothel.